The Transalp Trekking Dolomites is something of a minor sensation. Sticking to well-paved roads, but far away from bothersome traffic, our route cuts through only the sunny sides of the Alps. Legendary mountains such as the Tre Cime di Lavaredo and the Monte Cristallo lie on our path. Without endless ascents or knotty paths, you'll gain high alpine experiences. Riding on a former railway line, we will glide through the dream world of the Dolomites and roll directly into Veneto, the Beverly Hills of the 16th Century. At our destination, villas and the cuisine of Veneto will pamper all our senses. We'll start on the sunny side of the Alps, riding through the Eisack Valley, passing mighty castles. We'll cross into the Pustertal via a hidden access path. Overnight stop in Bruneck at a 4-star wellness hotel. Lake Prags is an emerald framed between the white peaks of the Dolomites. Today we're climbing up really high. Our destination is Toblach/Dobbiaco. The group is divided into two hotels. Distribution after booking receipt. The highlights don't stop coming. 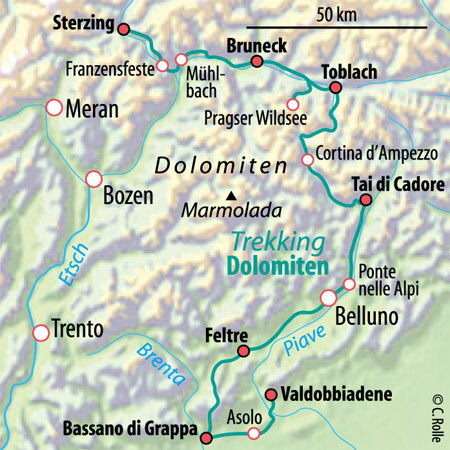 The old Dolomites railway line runs directly into the heart of the Dolomite mountain range. We pass by crystal clear lakes, the famous rock towers of the Tre Cime di Lavaredo and the fateful mountain Monte Cristallo. After the lunch break, we begin an almost endless easy descent towards Venas di Cadore. We'll enjoy Italian cuisine. The descent doesn't end today, either. A wild, unknown side of Italy envelops us. However, once we reach Belluno, we'll revel in luxury. In the 16th Century, Venetians built their villas here. In a bit of time travel, this ancient splendor lives on as we ride by on our bikes. We'll stay overnight in Feltre, a medieval jewel. The city alone is worth the trip. We still haven't used up all of our altitude. In a fast-paced ride, we'll descend into the valley of the raging Brenta river. We'll follow the river into the Venetian plain, into the pulsating Italian life of Bassano del Grappa, an old trading town. We'll stay in an exclusive designer hotel. Wine, villas and rolling hills mark our route on the last day. At our destination, corks may pop. There's no better place for that than Valdobbiadene, home of Italian Prosecco. Overnight, we'll stay in a Venetian villa. We'll have a multi-course farewell dinner. After breakfast, the bikes are loaded onto the bus. Return trip by bus back to Sterzing. Upon arrival in Sterzing, everyone travels home individually. Inga van Gessel, ALPS bike guide for the Transalp Trekking Dolomites. Arrival: Arrival by car or train to Sterzing/Italy. Type of route: Forest and bike paths, asphalt secondary roads. Included in the price: Guided tour with 7 overnight stays and half board (breakfast buffet, multi-course dinner menus) in mostly 4-star hotels in a double room. Luggage transport, return transfer in a comfortable bus. June: 15. /	22. * /	29. August: 24. /	25. /	31.